Documenting the movements of mini pigs while in rescue is imperative to protect the pig and the organization or individuals involved. Without documentation, the pig could end up in the middle of a legal struggle. A microchip number should be included on all contracts referencing the pig as soon as it is inserted. This permanent ID will prove the pig in the care of the rescue is in fact the pig mentioned in the contracts. All contracts should be signed and dated by the individual and by a representative of the rescue. 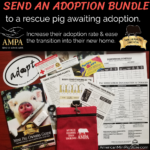 Applications and contracts protect the pig & protect the rescue organization. Owner understands and agrees that if his or her pig is not picked up within fifteen (15) calendar days after the scheduled pick up date, or owner refuses to pay agreed upon charges, the pig shall be deemed to be abandoned and may be re-homed at PIG PEN HILL MINI PIGS sole discretion without owners knowledge or approval. In some cases a Release of Liability is warranted to protect the rescue. An important part of the adoption screening process is to visit the home, inspect the living environment, and meet the family face to face.